As a beauty blogger, I get to try different products all the time. Usually, when a product gets over, I always have another product ready for testing. But its a rare situation where I get to miss a product that it has got over. That happened with Matru Ayurveda’s products. If you had read my review of their Anti-Tan Neem Chandan Ubtan, you would know how much I loved it. And not without a good reason. 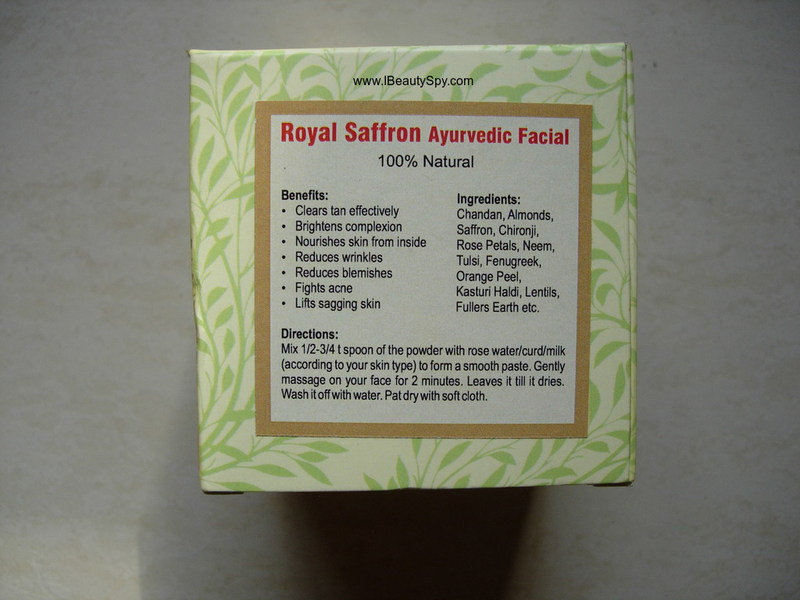 Today, I will be reviewing Matru Ayurveda’s Royal Saffron Ayurvedic Facial. I have finished up both the products and was really sad that they got over. I will be ordering them soon again. Such is the efficacy of Matru Ayurveda’s products. They are really effective and show quick, visible results. Plus they are completely natural and free from harsh chemicals. So let’s move on to the review of Matru Ayurveda Royal Saffron Ayurvedic Facial. Made using natural ingredients, nourishes the skin, while clearing tan. Reduces wrinkles, brightens complexion and lifts saggy skin. Chandan, almonds, saffron, chironji, rose petals, neem, tulsi, fenugreek, orange peel, Kasturi haldi, lentils, fillers earth, etc. The product comes in a sealed pouch packed inside an outer carton box. Once you open the pouch, there is no need to transfer the contents. It can be stored inside the carton box. 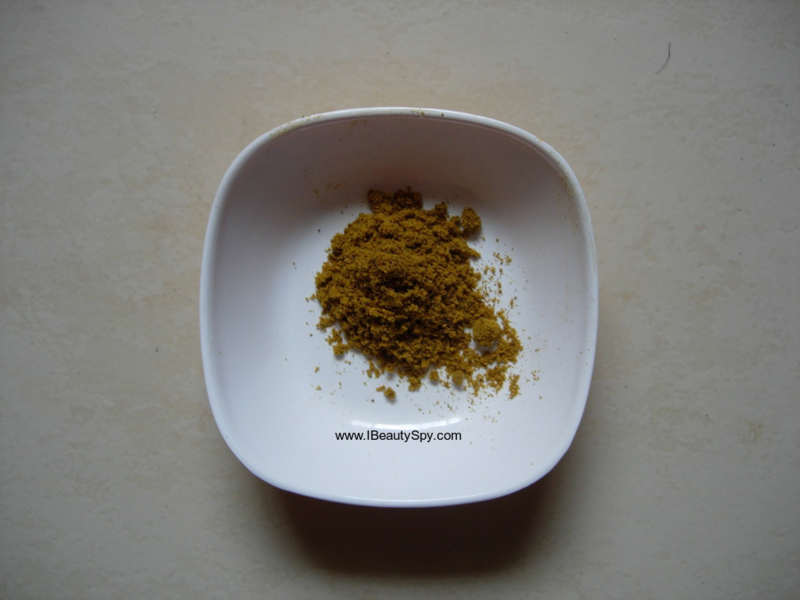 Matru Ayurveda Royal Saffron Ayurvedic Facial is in powder form, brown in color. I take about two spoons of the powder and mix with milk cream. I have dry skin, so I use milk cream. Depending on your skin type, you can use rose water, curd, milk, cucumber juice, etc. So the product can be used by all skin types. I apply a thick layer on my face and leave on for 20 minutes and then wash off. The results were amazing. My skin looked bright, radiant and glowing. It looked healthy and nourished. The mask also firmed my skin giving it a youthful appearance. The results are similar to a expensive facial done at a parlour. Since its made using all natural ingredients, it is safe to be applied under the eyes also. My dark circles were visibly reduced and am really happy about it since no eye cream worked for me in reducing them. For once, there is a product which really does what it says and quickly too. The ingredients list look pretty impressive as well with chandan, almonds, saffron, rose petals, chironji, lentils, etc. 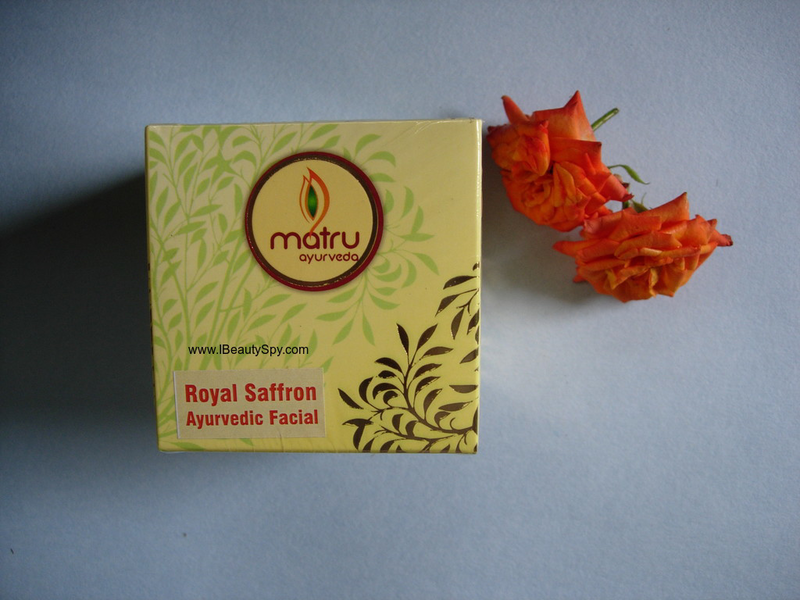 Matru Ayurveda Royal Saffron Facial is surely a royal treat for your skin. * Makes skin bright, radiant and glowing. * Skin looks healthy and nourished. * Firms skin, so can be used as an anti-ageing face pack to maintain youthful skin. * Gives effective results from first use itself. Packaging can be improved to a tub with a wooden spoon. Yes, definitely for everyone. It is suitable for all skin types, even sensitive skin. I would definitely recommend everyone to invest in these two products from Matru Ayurveda – Anti Tan Neem Chandan Ubtan and Royal Saffron Ayurvedic Facial. Its one of the most effective products I have used and its 100% natural. The combo helps to clear tan, reduce breakouts, brighten complexion and give a radiant glow. Also, if you are facing ageing issues, it is an excellent anti-ageing product as it firms and tones skin, giving a youthful appearance. So go ahead and treat your skin to the goodness of Matru Ayurveda. Sound looks good. Nice and detailed review. I have acne prone skin and very high skin damage by sun along with dark spots. May I use it. Yes you can. But I think their other variant Neem Chandan Anti-Tan Ubtan will be suitable more for you. I have reviewed that also in my blog. You can check it.